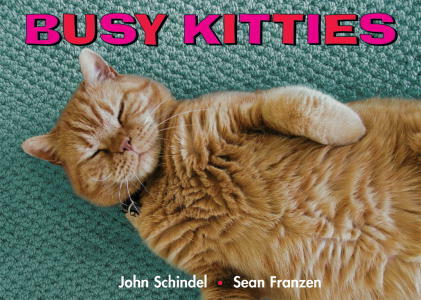 This rhyming board book by John Schindel and Sean Franzen is a great primer on cat behavior for little ones. The kitties stroll, roll, hiss, kiss, think, and drink. The photos are delightful, showing a variety of cats (none purebred, as far as I can tell) engaged in all sorts of things that cats do. When she was smaller, kiddo enjoyed discussing the different colors in the book, as well as comparing the cats — some have long hair, some have short, and one appears to only have one eye. Ages 0-3. For other reviews, click here. My daughter adores this book and laughs at all the cat antics. We thought she was done with board book, but after getting it as a gift, we found she can “read it” using the pictures and past readings.